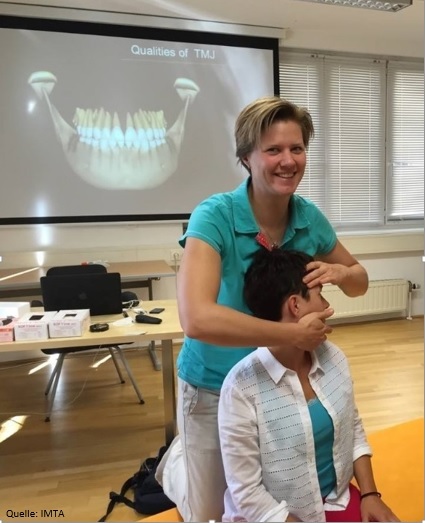 A further important building block of manual therapy which requires specialist qualifications, is the treatment of the jaw joint in the case of Cranio-mandibular disfunction (CMD). CMD occurs when the upper and lower jaw do not interact correctly. Suboptimal interplay can affect all movements of the jaw, and can even affect neighbouring and distal organs. The name cranio-mandibular disfunction originates from the words cranium (skull), mandibula (lower jaw) and disfunction. Patients with jaw joint issues and CMD often look for alternative medical opinions and treatment. Tension headache: tension-type pain which occurs on one side of the head may be due to cranio-mandibular disfunction. Facial pain and ear aches: due to the close proximity of the ear and jaw, many patients often experience jaw joint pain as ear ache. Spine and neck tension: inadequate and over-exerted muscles can negatively impact the spine and jaw position in several ways. Recurring or therapy-resistant tension of the spine could suggest a diagnosis of CMD. Grinding of the teeth: Bruxism (teeth grinding) is an unnaturally long and hard rubbing together of the teeth. Patients rarely notice their own overactive jaw movements, as teeth grinding usually occurs during sleep. Teeth grinding often occurs as a bodily reaction to stressful situations and may accompany a psychological illness. Snoring and sleep apnea: prolonged excessive rear displacement of the lower jaw can result in a narrowing of the oropharyngeal passages thereby causing snoring and breathing difficulties during sleep. Audible jaw movements: rubbing or clicking sounds in the jaw can indicate a structural change in the joint. In this case, an explanation should be sought to ascertain if the noises mean that therapeutic intervention is required. For example, such noises could indicate the atlas (the top-most vertebrae of the spine) may have reduced mobility which can be addressed in treatment.